Assessing the veracity of a news story is a complex and cumbersome task, even for trained experts. Fortunately, the process can be broken down into steps or stages. A helpful first step towards identifying fake news is to understand what other news organizations are saying about the topic. We believe automating this process, called Stance Detection, could serve as a useful building block in an AI-assisted fact-checking pipeline. So stage #1 of the Fake News Challenge (FNC-1)focuses on the task of Stance Detection. Stance Detection involves estimating the relative perspective (or stance) of two pieces of text relative to a topic, claim or issue. The version of Stance Detection we have selected for FNC-1 extends the work of Ferreira & Vlachos. 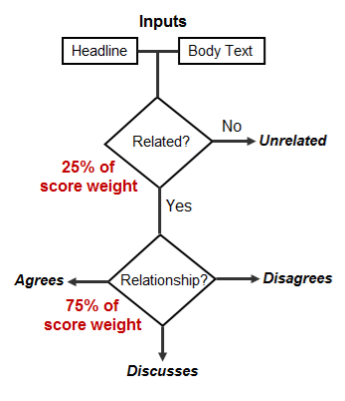 For FNC-1 we have chosen the task of estimating the stance of a body text from a news article relative to a headline. Specifically, the body text may agree, disagree, discuss or be unrelated to the headline. You must submit your predictions as a zip file containing a file called `submission.csv` (with no directories). This file must have the same structure as the file `train_stances.csv` from the training data. Namely, it should be a CSV file with header, containing three columns `Headline`, `Body ID`, `Stance`. The order of rows must be the same as in the training/test data files. To validate the format of your predictions you can use the Development phase of this competition or the scorer from the official GitHub repository. All winning teams must open source their solutions/systems with an Apache 2.0 license. Start: May 31, 2017, 11:59 p.m. Description: Evaluation on Test Data. This is the real deal, and you will be submitting results on the test data. Each team gets a maximum 6 submissions. The leader board positions are hidden to prevent teams from fitting to the test set. The 6 submissions are simply to ensure each team gets to change their submissions at most 6 five times. Only the latest submission will be considered for the final scoring. June 2, 2017, 11:59 p.m.